Whatever their motive, home sellers want drive-by home buyers to be impressed enough to stop or come back later for a closer look. Curb appeal starts at the curb, but it doesn’t end there. Everything from the mailbox to the doorbell can send a strong “welcome home” message to buyers. 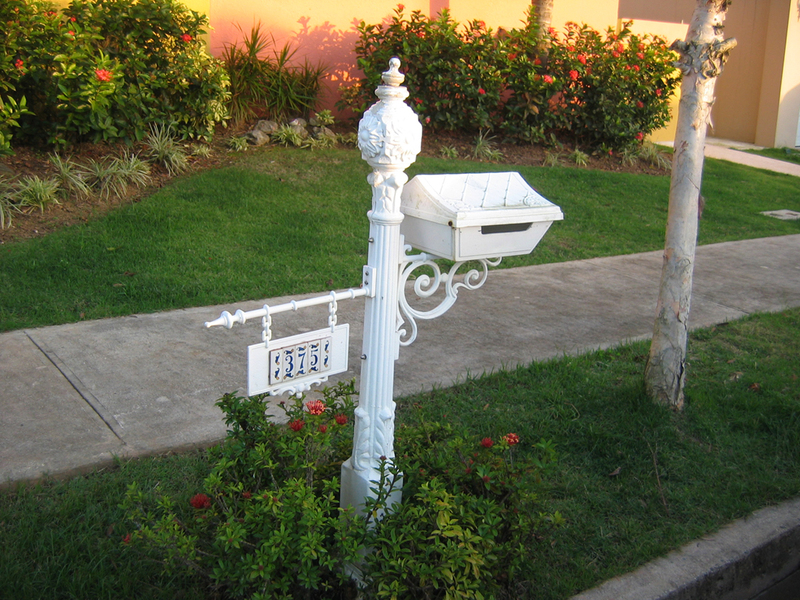 Consider a new mailbox and address marker to lend a little style to the homestead. As always, aim for a neutral look to appeal to a broader range of buyers. This is not the time to entertain visitors with unique style preferences, such as an over-sized novelty mailbox! Painting shutters and the front door to match can add a stylish first impression. When painting, stay with a basic color palette. Home stores may sell unusual, premixed colors at a discount, but purple, pink, neon-brights or baby blues will turn away many buyers before they get past the front door. A charming home has many qualities, and lighting is at the top of the list. There’s something about the warm glow of a lantern-style porch light, the charm of a classic lamppost, or the welcoming appeal of a sturdy and stylish new lamp in the front window. Some sellers line front yard or garden walkways with solar lights – a practical and pretty addition. Lighting is both functional and fun … an easy way to display a home’s best features. Nothing says “welcome” like a new welcome mat. Just remember to select a neutral color and style. One person’s favorite sports team could be another’s nemesis! That monogrammed personal doormat or rustic Americana motif – no matter how attractive – can hinder a home buyer’s vision of his or her own ideal décor. One homeowner’s bone-shaped doggie mat can send an unintended message to another who is allergic to pets. Someone’s clever joke to familiar family and friends may be lost on a visitor with a different sense of humor. As always, keeping it neutral and playing it safe will appeal to a wider range of buyers. For a final touch of class, consider a high-quality coordinated metal kick-plate and door knocker to greet potential buyers. A manicured lawn and a few well-placed shrubs can lend instant appeal. Hanging plants, potted plants, flower baskets, window boxes and flower beds will welcome a new buyer home. For winter-time charm, consider miniature pine trees or evergreen garland with pine cones as a floral substitute. Remember to keep it simple. Tastes vary and less is more. Choose a similar color scheme for all containers for a professional look, or stay with neutrals. Add a bird house, bird bath and bird feeder to welcome both feathered friends and buyers! In bedrooms, add neutral but coordinated window-coverings, bedspreads, pillows and shams, with fluffy down-feather pillows to make rooms look comfortable and cozy. Before welcoming that first home buyer, do one last walk-through. Pay attention to every detail throughout the home, from fresh towels and hand-soaps in the bathroom to a wicker basket with magazines by the easy chair to a colorful teapot in the kitchen. These are the things that invite an appealing first impression and an appealing final selling price, too! This writing sample represents work formerly published on Suite101.com, an online magazine.